Amy is back in Alaska, and preparing herself for a job that involves collecting deer poop in the back country. Yes, that's a job, and yes, we'll talk about it in more detail in a future blog post. But Meaghan is feeling helpful, and wanted to give Amy a few tips she learned in the backcountry while surveying for lichen and slugs (yes, that's also a job, and yes, we'll talk about that too some day). Today's tips are all about the worst part of fieldwork: getting through shrubbery. See, all bushes are horrible when you're walking off trail, but they're all awful in their own ways: each is its own special, shitacular snowflake. Some bend beneath your weight only to slam back up into your crotch when you least expect it, while others offer a wooden jungle gym you'll have to force your way through like Catherine Zeta Jones in Entrapment. Here, Meaghan shares some of her top moves for circumnavigating shrubbery struggles. 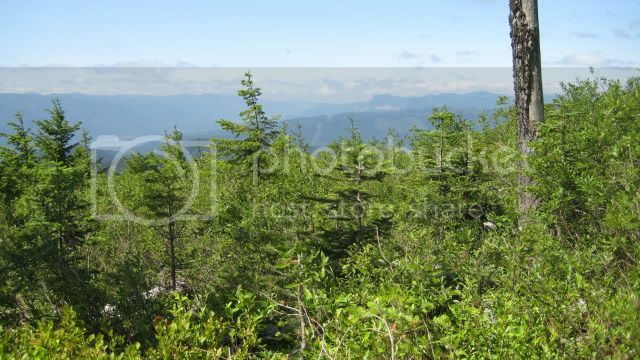 Manzanita: does it have more white flowers, or more ticks? Manzanita grows in thick, tick-containing clumps in any open space. It is a resilient bush which bends beneath the weight of winter snow, and its leaves are as slippery as a three-year-old covered in sunscreen. Going downhill through a thicket of them can be a real treat (for you and the ticks) as you can simply sit on them and slide straight down through the branches in a gentle, unexpectedly rapid and exhilarating descent. As for going uphill through them.... good luck. Without the pathway, this would be a solid minute's worth of cursing to get through. Rhododendrons are truly the devil-spawn of the plant world. They are stinky, sticky, and horrifically tough. Their limbs twist in shapes no mere mortals' mind can understand, forming a deformed hell bush that enjoys striking the unwary in the eyes. Additionally, the leaves are contorted just right to hold immense amounts of water, which they enjoy then dumping all over your face. 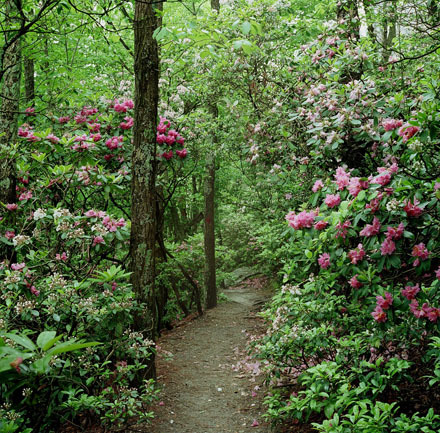 The best way to go through a rhododendron is to crawl through the myriad passages like you're breaking out of prison, hoping your backpack/clothing/hair won't snag on the many angry branches. Meaghan hates rhododendron with such a passion she has sworn a sacred vow to tear them out of any of her future gardens and burn them while saying things like "and that's for that other time you slapped me in the eye with a cup of ice water!" Devil's club doesn't even pretend it wants to be your friend. Some plants are less subtle about their assholery than others, and sport thorns of varying lengths and obviousness. Here's how to get around them, but be forewarned: this is not a move for the inexperienced, those with hip problems, or those who aren't wearing pants. Though really, we pity the fool who doesn't wear proper field gear and encounters Devil's Club or Salmonberry. Lift up each of your legs in turn (as one typically does while walking) and swing your legs around in a outwards-rotating motion, using your feet to push and then trap the brambles to the side. DO NOT ROTATE IN AN INNER DIRECTION. This results in thorn-crotch, a condition that nobody should have to ever deal with. Like this, but on hills! And more! The vine maple is simultaneously one of the most difficult of the shrubs, and the easiest. See, vine maples are sturdy creatures: their limbs cannot be moved by the mere will and muscle of man. However, they have just enough give in them that, using your full body weight, they will move just enough to allow passage. The best way through a vine maple is to climb it. The boughs will bend beneath your weight, folding open for you. But beware: a wet vine maple is a death trap, for not only will your feet slip, but the second less than 80% of your weight is on a branch the plant will retaliate, springing back up and flinging you forward like a slingshot. Inevitably this will be directly into a patch of Devil's Club. Come closer! We just want to cuddle/ensnare you! The only way to get through huckleberry is to scream your wrath and plow straight through. What, you don't believe Meaghan? Think she's tossing you a softball bush for shits and giggles? Well, to be fair she is shorter than the average human so bushes offer more menace ("They're like trees to me! "), but thick patches of huckleberry do what nothing else does: they tangle. It's like stepping into a stiffened yarn forest. The forest comes alive around your ankles with the sole purpose of making you look like a dumbass. So run through and suffer: there is no better way. The one on the left is now in charge. Get worried. Interested in being updated when we post new material, or horrible photos of ourselves? Like us on Facebook, follow us on Twitter or Instagram, or if you're really technologically incompetent we're also on Google +!